Stylist may be a word that is foreign to you. Maybe you've only heard about celebrities using them. Maybe it just seems weird. If you’ve reached the level where your appearance is important to you -- if you’re single looking to meet the right partner, or you’re managing a team, or if you simply want to create a new chapter in your life -- your appearance is one of the easiest ways to do it. But couldn’t you just buy the clothes yourself? Or read a ‘how-to’ guide online? Of course and most men do! 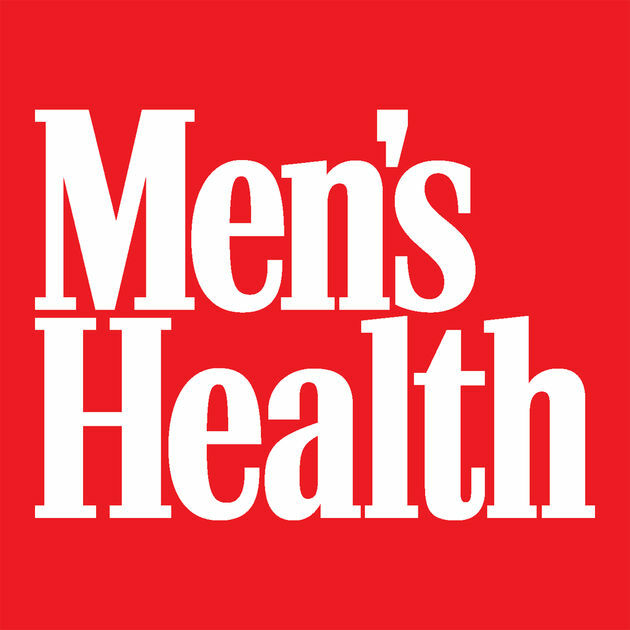 For a select group of men who want to look their best -- who are ready to invest in themselves and their image-- wouldn’t you want to give yourself every advantage of convenience and an incredible style that is custom to YOUR life? 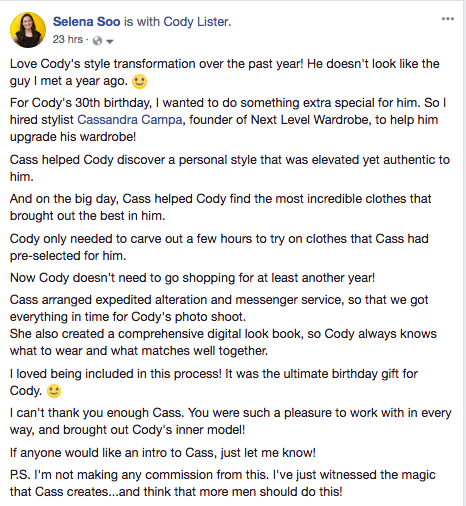 Next Level Wardrobe clients- before + after photos. I’ll show you what I mean. Think about the last time in your life when the stakes were high. Imagine it was a big meeting at work -- the kind that can lead to a big project being green lit (and a big promotion). What kind of work went into getting ready for that meeting? How many nights of meeting prep would you do? How many hours of practicing your presentation? When the stakes are high, we spend the time to do it right. What outfit would you want to wear when the stakes are high? So why is it that we don’t take the time to decide what image that we want to portray through our clothing? Most people don’t spend much time thinking about what they wear but your style lets you control the way the world sees you. You know that you can read the hundreds of ‘how-to’ guides on Reddit or GQ or even spend time going shopping on your own. But you deserve a service that is curated to your specific needs, lifestyle. and you know what- it's ok to ask for help! That’s where Next Level Wardrobe comes in…. 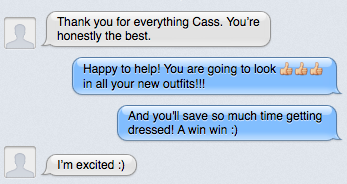 When we go shopping I’ll pre-select all clothing for you ahead of time & have it waiting in your private fitting room. From there, I create head-to-toe looks that will make you look great for different scenarios: work, social, travel, and day-to-nighttime transitions. 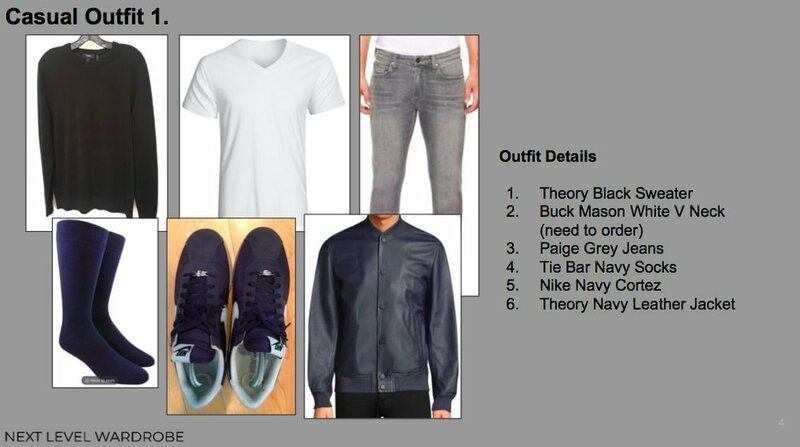 Every morning when you wake up, you’ll know exactly what to wear and save time getting dressed- a simplified clothing routine! I’ll organize and edit your closet, photograph your outfits, and recommend different options for special events coming up on your calendar. That way you can spend your valuable time on things that are a priority to you. Pictures of a client's closet before a wardrobe assessment (left) and then photos upon completion (right). 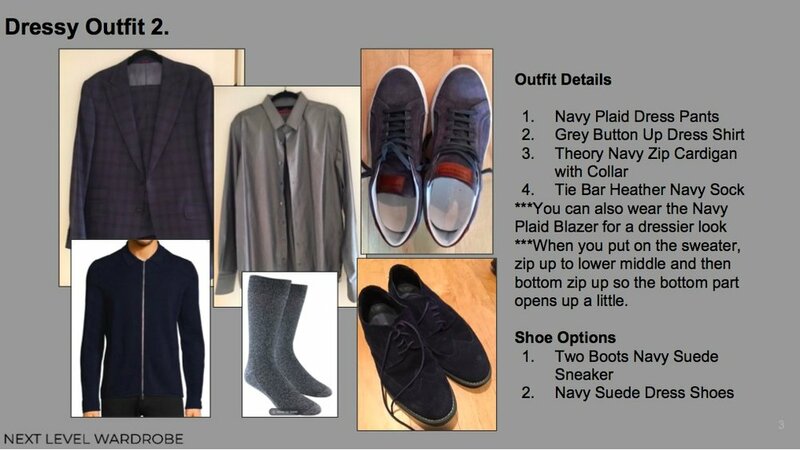 The finished photos show a simplified wardrobe and how much easier it is to see what he owns-- which means saving time when it comes to getting dressed! 2. Style that fits your lifestyle. Take the guessing out of those 'how-to' guides and get something that is just for you. Let's face it, most guys don't want to dress like what they see in the magazines so I create custom looks for each client that is specific to their lifestyle and needs. For example, an entrepreneur will dress differently than an investment banker. A single man may dress differently than a married man. Your look should fit you -- and communicate the image you want, which could be fun, bold, authoritative, creative, or serious. Here is an example of the digital look book that I create specifically for each customer. Imagine how much time you would save if you had this in the morning! 3. Look incredible -- effortlessly. Remember the last time that you got complimented? How did it feel? Was it from your partner or a stranger on the street? 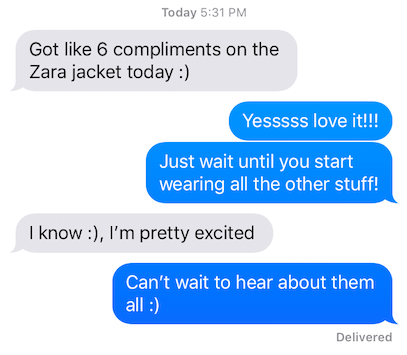 This is a text from a client, hours after our shopping trip. He wore a jacket that was bought and was complimented! With Next Level Wardrobe, you’re hiring me to save you time. That means you’ll know exactly which brands fit you, what sizes fit you best, and what to wear for different occasions so you can focus on what is important to you- family, friends, career etc. The right clothes show that your life is under your control. That you’re successful enough to be thoughtful about what you wear and that you take the time to control your image to the world. I believe that every man should give himself every advantage in life. If you’re reading this, you already know style is important. The next questions are: What’s the image you want to create? And how do you do it? That's where Next Level Wardrobe comes in. Hi there- I'm Cassandra Sethi and I’m a NYC Personal Stylist. I also am the Founder of Next Level Wardrobe. I believe that men and women deserve to look good and feel good. I believe that men and women deserve to give themselves every advantage in life and control the image that you portray through your clothing. I have over 15 years of experience within the fashion industry and have a Bachelor of Arts in Fashion Merchandising as well as a Post graduate certificate from London College of Fashion. Most recently, I worked in New York City within the luxury fitness industry -creating Soulcycle’s retail business and most recently as a Senior Buyer for Equinox Gyms. I realized that there are many people who are frustrated with a typical shopping experience, don’t know how to dress for work or their body type. And frankly, they just don’t have the time to create the right wardrobe. 1/ to save you time getting dressed so you can focus on other things in your life and look great while doing it. 2/ to create a wardrobe that is customized to your lifestyle because you should walk into every situation with every advantage in your favor, including your clothing. 3/ to help you look good and get you noticed because let's be honest, it is always nice to get a compliment. I look forward to helping you take your wardrobe to the Next Level! Imagine waking up every morning and being able to dress yourself with confidence and ease. No more putting outfits together last minute (or wearing the same thing everyday!). No more guessing what looks good on you. No more of not being control of your image. By signing up with Next Level Wardrobe, you will be able to dress yourself effortlessly day-to-day so you can focus your time on what’s important to you- whether it be extra hours with your partner, family or your career. After working with NLW, you will have refined your personal style and probably received a few compliments! Most importantly, you will have a whole new wardrobe that is completely custom to you and your lifestyle- you will know what looks good on you, where to shop, and how to put an outfit together. I am located in New York City (Manhattan), but can travel anywhere at cost to the client. This 3 hour session focuses on editing your closet focusing on what you should keep and move on from. Don’t worry about whatever clothing you get rid of, with my clothing takeaway service it will be donated! After this session is done, I will create your customized 'shopping list' of items that are opportunities for your wardrobe. This will be the focus of shopping trip. In this 3-4 hour session, all the work is done before you step foot into the store! I will provide an agenda of stores visiting and have your clothing waiting for you in your fitting room so all you have to do is start trying it on. I will use the 'shopping list' created custom for you to concentrate on what you need, so you can make sure you are purchasing items that you need. For whatever we do not find, I will continue the shopping for you online and send you links so you can purchase. For this last session, I will create custom head to toe looks for you and educate you on how to do it yourself. I will also send you a digital look book using clothing that you own, to save you time when getting dressed. We will also go through care instructions to ensure that you get the longest life out of your clothing. Take the stress out of knowing what to pack for business or personal travel, with the pack and go! Based on your events during your travel, I will create looks for you and then provide a digital look book for you to reference while you are away. Don't have time to go shopping or wonder what to wear for your wedding? I got you covered. In this package, I will curate various outfits for you that are in line with your partner; from engagement to the big day (and everything in between such as rehearsal dinner). This also includes guidance on grooming, accessories, tailoring and a customized digital look book with outfits for you to wear to each event. This package is all about getting your look prepped for your next big event or conference. Based on the feel and needs of what you want to communicate, I will curate a head to toe look for you so you can dress with ease and confidence.